A normalization in cash conditions following the demonetization of late 2016 and the fading of disruptions from last year’s launch of the Goods and Services Tax should facilitate the economic recovery in FY 2018. Nonetheless, risks of fiscal slippage in the run-up to elections next year, concerns over the banking sector in India, increasing global trade tensions and higher oil prices all cloud prospects. Our panel expects GDP growth of 7.3% in FY 2018, which is unchanged from last month’s estimate, and 7.5% in FY 2019. Growth in Russia is expected to pick up this year, thanks to strengthening private consumption and firmer oil prices. An improving labor market and low inflation should buoy household spending, while higher commodity prices will support export growth. That said, high geopolitical uncertainty and the possibility of further economic sanctions remain key risks to the outlook. FocusEconomics Consensus Forecast panelists see GDP expanding 1.7% in 2018, which is unchanged from last month’s forecast. In 2019, growth is seen steady at 1.7%. Brazil’s growth forecast was chopped for a third consecutive month as the truckers’ strike, a less supportive global backdrop and higher oil prices dent the country’s outlook. 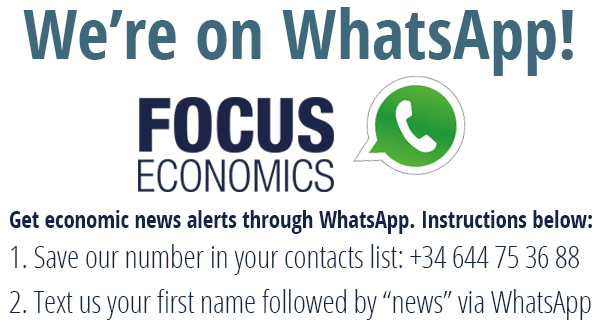 FocusEconomics panelists now see the Brazilian economy growing 1.7% this year, down 0.2 percentage points from last month’s forecast. A market-friendly outcome to October’s election remains critical to ensuring a sustainable recovery; however, this is far from certain. Next year, GDP is seen growing 2.5%. Household spending and exports are expected to drive growth this year in Mexico. Tight job markets—both domestically and stateside—and improved private-sector lending should support private consumption, while healthy factory output in the U.S. should bolster manufacturing exports. Uncertainty over NAFTA continues to weigh heavily on investment prospects, although the odds of reaching a deal have improved in recent weeks. On politics, most analysts currently expect AMLO to govern as a centrist. FocusEconomics panelists expect growth of 2.2% in 2018, down 0.1 percentage points from last month’s estimate. For 2019, panelists see growth stable at 2.2%. Despite a healthy first quarter, the pace of growth is expected to slow sharply this year. The loss of agricultural output following the severe drought; extremely high interest rates and currency volatility, which will weigh on investment decisions; and consumer spending constrained by low confidence and rapid inflation are seen driving this deceleration. Panelists participating in the LatinFocus Consensus Forecast foresee the economy expanding 0.4% in 2018, down 0.5 percentage points from last month’s forecast. For 2019, growth is expected to reach 1.9%. Economic growth in Turkey will likely weaken in the coming quarters, on tighter financial conditions, shaky investor sentiment and a higher oil import bill. Exchange rate volatility, geopolitical tensions, a gaping current account deficit and elevated inflation pose downside risks. FocusEconomics panelists expect growth of 4.2% this year, which is unchanged from last month’s estimate. They see growth of 3.5% in 2019. Higher inflation and a loss in consumer confidence should lead to a marked slowdown in consumer spending this year, denting GDP growth in Romania. Although the expansion in fixed investment should gain some strength, low EU funds absorption will limit the extent of the acceleration. Downside risks stem from widening fiscal and current account deficits. FocusEconomics panelists expect growth of 4.1% for 2018, down 0.1 percentage points from last month’s forecast, and 3.6% in 2019. The Egyptian economy is expected to grow at a solid pace in FY 2019. This is due to higher investment on the back of increased government spending and an improved regulatory environment. Moreover, the external sector should continue to benefit from the weaker pound. However, large fiscal imbalances and the higher price of oil will weigh on prospects. FocusEconomics panelists expect GDP to expand 5.1% in FY 2019, which is unchanged from last month’s forecast, and 4.9% in FY 2020. Greater political stability and firm credit ratings bode well for the South African economy in 2018 as full-year economic prospects look set to largely ride out the weak first quarter. Real wage gains should support stronger household spending this year, while the government’s push to attract investment should bolster capital outlays. Nevertheless, fiscal slippage and a slow reform agenda are likely to constrain growth over the medium term. FocusEconomics analysts expect growth of 1.6% in 2018, down 0.3 percentage points from last month’s forecast, and 2.0% in 2019. Higher oil prices, improved liquidity and increased public spending in the run-up to the 2019 elections should fuel faster growth this year in Nigeria. However, political uncertainty, as well as security concerns, continues to pose risks to economic activity. FocusEconomics panelists expect GDP to increase 2.4% in 2018, which is down 0.1 percentage points from last year’s projection. Next year, growth is seen rising to 2.9%.